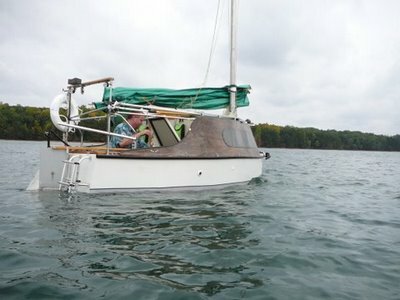 Dissatisfied with the available production boats for what he terms mini cruising, Bill Longyard decided to design and build his own, to "show what could be done with 14 feet". And show he did, and then some. His little Lucky Town design has sitting headroom for two and enough enough space for a six footer to stretch out comfortably. There is a flush toilet and holding tank and provision for a shower, though the shower's not yet implemented. The Junk rig is made from polytarp and cost about $100. and can be reefed from the cabin. Bill finds the Jung rig far more friendly than any other rig he's used, including gaff and gunter. 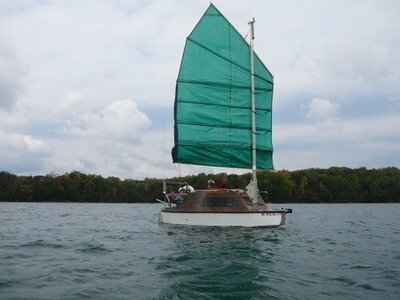 She ha a 246 pound drop keel and an aluminum kick up rudder. There's a 4hp diesel in the aft compartment which is used to charge two marine batteries which in turn power a 55 lb. thrust trolling motor, judiciously used. He also carries an air compressor, radio bank and a solar panel. Quite a lot in a 14' loa 6' beam cruiser. The boat is trailed with a small car and launches quickly as the mast has a spring loaded tabernacle and can be raised or lowered on the water, instantly. The Lucky Town 14 is a featured packed camper-cruiser capable of anything from week-end trailer sailing to extended blue water cruises. Light weight and low cost, this is an easy boat to build, the prototype having been assembled in ten days! Due to a very thoughtful arrangement of the cabin, which sleeps two and includes provisions for a proper marine head, and sit-down shower, this garage friendly boat feels like one that is eight feet larger. The "instant up" mast design allows you to raise, and lower, the mast singlehandedly at the ramp, or on the water. The recommended Chinese lug rig offers a wide safety margin in all wind conditions without the need for expensive custom made sails or reefing equipment. 1. 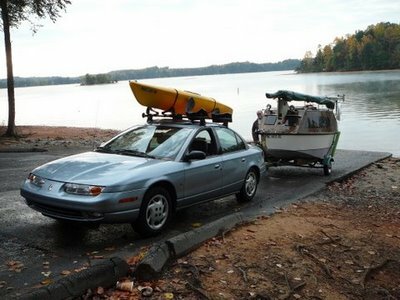 All production boats are too complicated to rig quickly at a launch ramp. The "instant up" mast of the Lucky Town 14 is unique. 2. 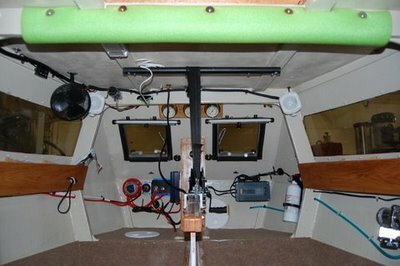 Most production boats have cockpits that are too large for safe sailing on anything other than a lake, or protected water. The self draining cockpit of the Lucky Town is comfortable, but also small enough not to allow the boat to squat in the stern if pooped in blue water. 3. Most small boat designs have too much weight aft, including the engine, which creates the potentially dangerous/fatal necessity of leaning over the transom to start the engine. Often this occurs during a collision avoidance scenario. The compartment on the back of this boat forces all movable weight (crew) to remain in the center of the boat, thus greatly aiding boat balance, and safety, even during engine starts. 4. Most small boats have marginal keels, either in weight, or span. Narrow keels are one of the reasons small boats can get "squirrelly." This tendency to yaw is due to the blade stalling hydro—dynamically. On the Lucky Town, the wide blade, combined with the skegs and balanced rudder, dampen yawing even when the crew shifts positions. 5. Most small boats require a hand moving forward to reef, take in a fore sail, or even the main. The Chinese lug rig allows for instant reefing, an unstayed mast, and the sailcloth to be made from common materials while still being able to handle heavier wind loads than even traditional sailcloth such as Dacron. 6. Most small boats are uncomfortable to sit in during a rain shower, or a hot sunny day. The Lucky Town has comfortable interior seated head room as well as fu|l—length bunks if desired. 7. No pocket cruisers under 19 feet have flushable heads and built-in shower facilities. The Lucky Town has provisions for these if desired. 8. Few pocket cruisers are fully beachable, and launchable by just one person. The Lucky Town requires only 10" of water when fully loaded. 9. Few pocket cruisers have cabin structures strong enough to survive a 360° beam to beam broaching. The full beam span of the cabin greatly enhances the strength of the boat, while making it much easier to build. 10. No pocket cruiser with this many features is as easy to build and requires neither scarfing, jigging, or the use of any specialty (expensive) wood. All the wood for this boat is available at any one of several national home center chain stores. Designed by noted small boat historian William Longyard (A Speck on the Sea), the plans include a 35 page illustrated manual with over 40 photographs showing the building sequence.